Many marketers choose to ignore Pinterest for their marketing efforts… That’s a big mistake. 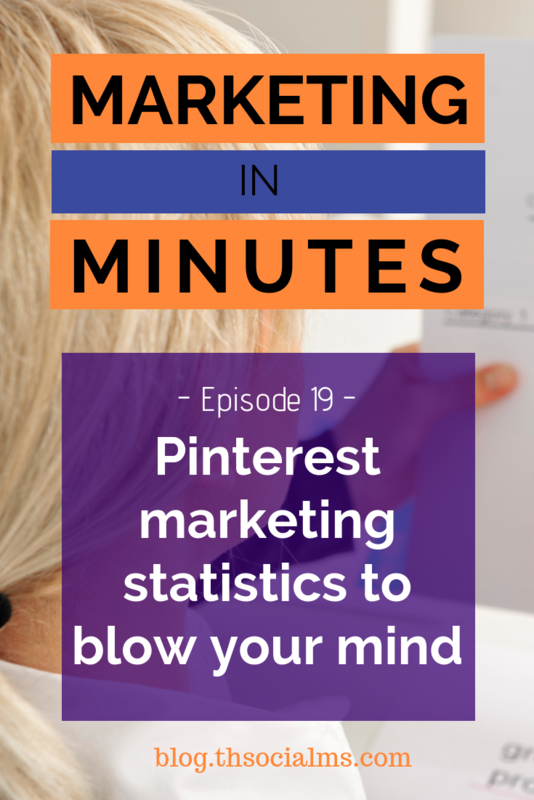 In this episode of Marketing in Minutes you will learn about some Pinterest marketing statistics that will blow your mind and make you start your marketing journey on Pinterest right now! To subscribe to Marketing in Minutes on any podcast platform, please go here. All in under 10 minutes! Pinterest isn’t the go-to network for most social marketers. But those who do work out how to get Pinterest to send them traffic and generate revenues tell a different story. And when you look at the important data, it all makes sense. I’m Jonathan Gebauer and this is Marketing in Minutes. Welcome to Marketing in Minutes by The Social Ms – the podcast that gives you all you need to know about one marketing topic per episode. I’m Jonathan Gebauer and today I want to talk about Pinterest marketing statistics that will blow your mind. A few episodes back in episode 13 of this podcast I talked about two underutilized networks for social media marketing: Twitter and Pinterest. I’ll put a link to that episode into the show notes. In that episode, I cited a recent article by search engine journal that said that only 6 percent of marketers get their most traffic from Pinterest. I also said that this is misleading: Because those who have found success on Pinterest really have massive success. I also briefly told you about MelyssaGriffinn. I want to give more details about her story today. Melyssa was working as an expat English teacher in Tokyo – but like most people with entrepreneurial ambitions, she just felt that it wasn’t enough. So, she started her blog, and she used all her passion and quickly tried out about any marketing tactic she could read about or think about. Her blog sparked her first business, and just a couple of months later, her side-business became her full-time job. She started by providing graphic design services, but soon after, she moved into online teaching. And that’s when her business started to explode. Melyssa’s success is largely based on her usage of Pinterest. Here is some data on that: Before using Pinterest for marketing, she had about 2000 email subscribers. In the first year of using Pinterest, she grew that list to 40.000. In the second year to 200.000. That’s some growth and Melyssa has used that growth wisely to build her multi-million dollar blogging empire. Now, can Melyssa, or anyone else promise you that you will see the same growth rates? No, of course not. which is also why you should never concentrate on marketing just via one channel. Also, it’s important not to concentrate on growth alone. Sure, it’s great to have a lot of traffic and a big mail list, but where does that get you when you can’t sell anything? That’s why we have to examine the audience of a social network in detail to decide exactly how we market on a network. And Pinterest really has some exciting statistics about their user base. Let’s examine them to find out whether you are missing out on something when you are not using Pinterest in your Marketing efforts! Of course, when it comes to examining social media sites, the first metric is active users and growth. Pinterest is currently growing at a yearly rate of between 35 and 40% and has been able to keep growth at this rate for the last couple of years. Pinterest’s growth rate is stable at a time when some of the biggest networks are reporting troubles. Twitter just reported a slight user decline in the second quarter of 2018, and even Facebook’s growth rate is currently stagnating. But only looking at the growth rates doesn’t get us anywhere: Pinterest is still only a tenth of Facebook in size, so if that was the metric to look at, I would have to recommend Facebook and nothing else. 40% of active pinners have a household incomes of over 100.000 Dollars. 50% of them have bought something after seeing a promoted pin, and 90% of active Pinners use Pinterest to make buying decisions. Let’s translate that into terms that make really clear why Pinterest is important for marketing: Pinterest users have money, they are looking to spend that money, and they actively use Pinterest to make a decision on what to spend that money on. This is all really important, but it’s not the most important part of the data… That’s still to come. The audience you find on Pinterest is probably also part of those 2 billion active users that are reported by Facebook. So a good marketer should be able to reach and become relevant to the same audience on Facebook, right? Here is the one Pinterest stat that truly blows MY mind. Here it comes: Pinterest users love brand content! 78 percent of active Pinterest users say they find brand content helpful, and 66% have actually made buying decision after seeing branded content! I want to make absolutely sure that you understand the importance of this metric: On any other social platform, users complain about branded content. We feel annoyed by advertising, we unsubscribe from brand accounts if we see too many of their posts, and we feel that promotional posts are intruding into our personal sphere. Not so on Pinterest – Pinterest users are not just accepting branded content – they actively search for it and want it in their feed. And they will buy directly if they like what they see! That’s why Pinterest users are different from Facebook users. Browsing Pinterest is the social equivalent of browsing a brands catalogue of products and then ordering what you like. That’s where the real power of Pinterest lies. It really doesn’t matter if most of your traffic comes from Pinterest – what really matters is how many of those visitors actually buy. This also explains some of those strange Pinterest success stories that seem so random when you first read about them. Back in 2012, Artifact Uprising was a small company – selling customized photobooks online. Not the kind of tech startup that you often read about – no big plans to change the world. Just a regular business – trying to make sales and survive. Like so many other businesses, they went for social media marketing at the time – and selling photobooks, a natural choice was Pinterest. When one popular blogger picked up their pin, things took a turn from normal to crazy for them. The pin instantly went viral – and going viral on Pinterest is different from going viral on Twitter of Facebook. Instead of the momentary surge of traffic you get on those networks, going viral on Pinterest usually has a lasting effect. Within a week, that one pin got them 48.000 clicks – without spending a single marketing dollar. But that’s not all of it: Here is where the buying power of a Pinterest audience comes in. This one pin allowed Artifact Uprising to build a multimillion dollar business in just over a year. How is that for a little bit of motivation? One pin for lasting marketing success? Of course, these were different times and Pinterest was still new, but the same effect can still be seen today! The willingness to buy from brands on Pinterest is still just as high as it was back in 2012 – and you can build your business on that buying power if you market on Pinterest. So, if Pinterest is not yet part of your marketing mix, you are probably missing out on a lot of business! That’s it for today’s episode of Marketing in Minutes. If you want to know more about marketing your business on Pinterest, check out the show notes of this episode which you can find at blog.thesocialms.com/MiM-19. 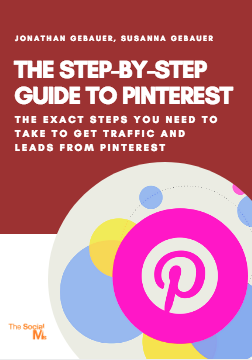 And if you want step-by-step instruction for your Pinterest marketing, check out our Pinterest Marketing Workbook. If you like this podcast, please subscribe and share it with your friends and colleagues. And if you are listening via Apple Podcasts or any other platform that allows you to leave a review – please do it. It really helps! I’m Jonathan Gebauer and you’ve been listening to Marketing in Minutes by The Social Ms.
That’s it for today – take care, bye!